Whiteoak’s Macy Knoblauch (24) and Eastern’s Mia Rockey (13) meet at the net during the first set of the Lady Wildcats’ match against the Lady Warriors on Thursday at Whiteoak High School. The Whiteoak Lady Wildcats registered their first Southern Hills Athletic Conference (SHAC) win and second win overall in 2018 as they beat Eastern’s Lady Warriors 3-1 on Thursday at Whiteoak High School. Whiteoak jumped out to a seven point lead in the first set after Sydnie Raines rattled off six straight service points to give the Lady Wildcats an 11-4 lead and force Eastern to call timeout. The girls from Mowrystown held onto a narrow lead for much of the first set as the Lady Warriors clawed their way back and took the lead when Hailey Hampton helped record 10 consecutive service points and Eastern took a 21-19 lead. The Lady Warriors went on to win the first set by a score of 25-21. Eastern rode the momentum from the first set into the second one and quickly built a 9-4 lead that caused Whiteoak to call an early timeout and regroup. Following the stoppage in play the Lady Wildcats were able to battle back and tie it at 12 points apiece. From there it was a back and forth second set. 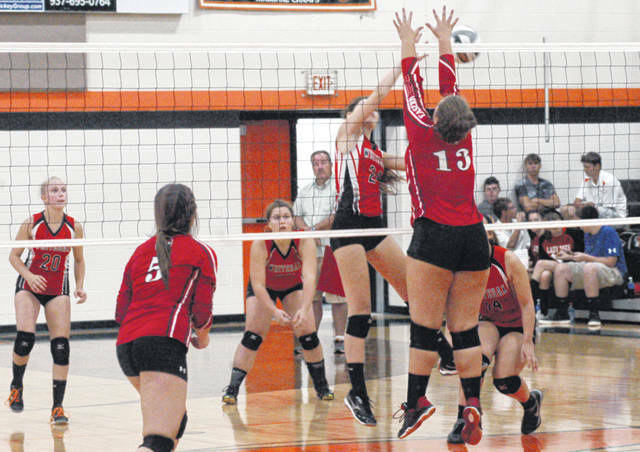 Whiteoak needed more than the usual 25 points to take the set as they won 27-25 and tied the match at one set each. The Lady Wildcats fought their way to a 12-7 lead in the third set before the Lady Warriors battled back with five straight points to tie it at 12. Jeanette Cox, a sophomore for Whiteoak, had a massive block in the set that allowed the Lady Wildcats to push their lead to three points and keep momentum on the side of the Highland County girls. Whiteoak won the third set 25-18 as Raines took over during the closing moments of the set as she recorded kills on the 23rd and 25th point of the set to help put the Lady Wildcats up two sets to one. Eastern looked lost for much of the fourth set as they allowed the ladies from Whiteoak to build a 20-14 lead. The Lady Warriors again battled back and got to within three points at 21-18 but it was too little too late as the Lady Wildcats won the set 25-19 and won the match three sets to one. The win improves the Lady Wildcat’s SHAC record to 1-4 and their overall record improved to 2-7. Whiteoak will be back in action tonight as they travel to Ripley to take on the Lady Blue Jays in a SHAC volleyball matchup.